IMPORTANT NOTICE: SharpSense has closed since this article was originally published. 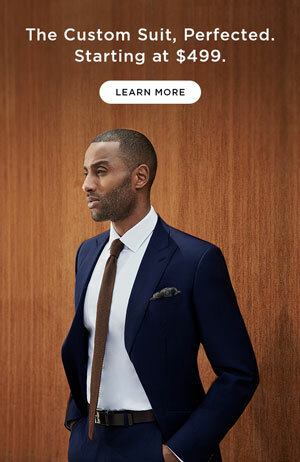 We’d now recommend Indochino as a great alternative for buying quality made-to-measure suits online. SharpSense is an online Canadian made-to-measure menswear company that claims to offer the best-fitting garment in its class. Being suit enthusiasts ourselves, we were delighted to see if they were truly up to the task. 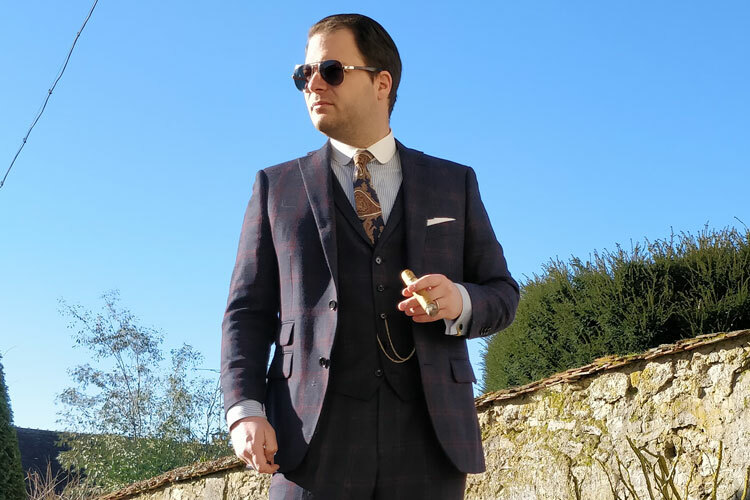 Having spent a fair amount of time in the custom and made-to-measure menswear industry, I’ve always been wary of web-based businesses touting their ability to craft quality garments based on measurements that a customer submits. How can a layman and his friend be trusted to take measurements accurately? How do you handle alterations, which will be necessary nearly 100% of the time? What if the fabric colors don’t look like what I expect them to, given the highly variable quality of cameras and computer monitors? The overall experience was generally positive. Read on for a full review. The fabric options for the two lower tiers SharpSense offers (Essentials and Premium) seem to be mostly wool or cotton blends. I advise against going this route unless you’re purely budget-driven, as natural materials tend to breathe more easily and wear better over time. Their Executive line is made of 100% natural materials, and I suggest you start there if your budget allows. If it doesn’t, you can still get a great-fitting garment at an affordable price by selecting Essentials or Premium. This is also something to keep in mind if you barely ever wear a suit and want to save on costs. Unfortunately, it’s quite difficult to tell the true colors of the fabrics you’re looking at, particularly for suits. The company does a good job of picturing close-ups of fabric swatches with each suit it offers, but the description often doesn’t match up to what you see. Dark navy looked grey, “black and brown” looked dark grey and tan, and so on. Typically I would chalk this up at least in part to monitor issues, but I’m using a 4K retina display that’s not quite a year old. With that said, I went with the Novara suit. It was listed as charcoal and is indeed charcoal in person, but it looks like a much lighter grey on screen. I’m very happy with what I received, but it’s a totally different color than what I saw on my display. The case is the same with shirts, though to a lesser extent. To combat this, the company offers samples that you can request for $3 per swatch. Once you place an order, they’ll deduct that fee from the total up to $15. You’ll need a friend (or in my case, a wife) to take your measurements. Conveniently, SharpSense will store these in a personal profile you create on their website, so you only have to do this once unless you need to update something. A nice differentiator that SharpSense has is the ability to include pictures of yourself. They strongly encourage you to upload front, back, and side views of yourself to help them nail the fit, and I second that encouragement. I applaud SharpSense for making the measuring process easy and relatively quick. There’s a short video for each and every measurement they want you to take, so even a layperson can do it accurately. 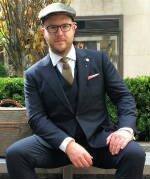 Top 5 Best Custom Suit Tailors In Patong, Phuket Thailand - Tried, Tested & Reviewed! SharpSense quotes a 4-5 week turnaround time, which I think is reasonable based on the fact that their merchandise is made in Thailand and then shipped to Canada before being sent to the States. Mine arrived in four weeks and two days, so my expectations were managed perfectly. I also received periodic tracking updates from the team at SharpSense. I always appreciate this kind of proactive outreach, as it makes me as a customer feel secure in giving a company my business. The clothes arrived folded in a 13.5″ x 11″ x 2.75″ box, so they needed a steam before wearing out in the real world. It’s a bit disappointing that the suit didn’t arrive on a hanger, but not a big deal all things considered. *Editor’s Note:* If you don’t own a steamer, stop reading this and buy one. It’ll change your life. As far as the quality of fabric is concerned, it’s a bit of a mixed bag. The purple gingham shirt has a nice feel and is a great shade of plum, the buttons on both shirts are decent quality and, just as importantly, are sewn on strongly. Collars and cuffs use fusing, which provides a stiff, strong look that I’m a fan of. There are stays in this collar, but no way to remove them for laundering. Sadly, the shirts don’t come with removable collar stays, and you aren’t given the option to add them during the customization process. There are indeed stays in the collar, but they’re thin plastic and easily bent. Be extremely careful if you iron these collars, as you can unintentionally press a collar stay shape into it. The white shirt had two specific issues. The fabric is a bit opaque. This isn’t something wrong with the shirt per se, it’s just a thin fabric. It’s unfortunate to have t-shirt showing underneath a custom dress shirt. In a display of excellent customer service, when I reached out to SharpSense to ask how they would handle the staining issue, they simply said that they’d remake the shirt for me and send a new one out as soon as it was complete. *UPDATE* I received a complimentary replacement white shirt on Saturday, 9/30/17. It’s in pristine condition and fits just as well as the original one. The suit I ordered is a charcoal grey herringbone from their Executive collection, and it’s 100% wool. What grade of wool it is, however, is unknown. This isn’t noted in the product description, nor in their FAQ section. Based on hand feel alone, I’d guess that it’s a Super 120’s wool, which is actually a good quality wool in terms of hand, longevity, and performance. SharpSense says that its suits are technically half-canvassed, though they could make the argument that they’re in fact “3/4 canvas” due to the length of the floating chest piece they use. I appreciate that SharpSense has such information on their FAQ page, and the longer the canvas chest piece, the better! It makes for a stronger presentation and an increased life of the jacket. One defining characteristic of a half-canvassed suit, however, is a machine-stitched lapel. This makes for a superior lapel roll and also increases a suit’s lifespan. You can tell a stitched lapel by rubbing it in between your thumb and forefinger. If it feels like sandpaper, it’s stitched. SharpSense’s suits, based on what I can feel, do not have such a lapel. Rather, it’s a fused lapel (it feels smooth and slippery when rubbed between the thumb and forefinger), which is a less expensive way to construct a suit. While this doesn’t technically affect the amount of canvassing the jacket has, it still falls in a grey area regarding an industry-wide term. *Editor’s Note:* Very minor alterations will be done on the jacket. We will post updated photos once complete. I’ll be frank: I am amazed at how well the shirts and suit fit me. I am not an easy person to amaze in this regard. My suit’s trousers fit beautifully. They came out with the high rise I requested, and the fit is slim, but not tight. The silhouette is modern but not terribly trendy. I’ll be sure to update this post with after-alteration photos, but I’m still incredibly impressed with the extent to which they hit the ball out of the park on the first try. Additionally, they offer an alterations credit of up to $100 for a two-piece suit, and you can take it to any local tailor for your convenience. Fit is the most important aspect of looking good. On this, SharpSense did a great job with the garments I received. I’m still blown away by the experience of putting the shirts and suit on, and I’m happy to recommend patronizing them based on this. They deserve a lot of credit for their ability to successfully circumvent the in-store experience in this regard. The rating is four stars instead of five due to the inability to remove the collar stays from the shirt and difficulty I had discerning fabric colors on the website. 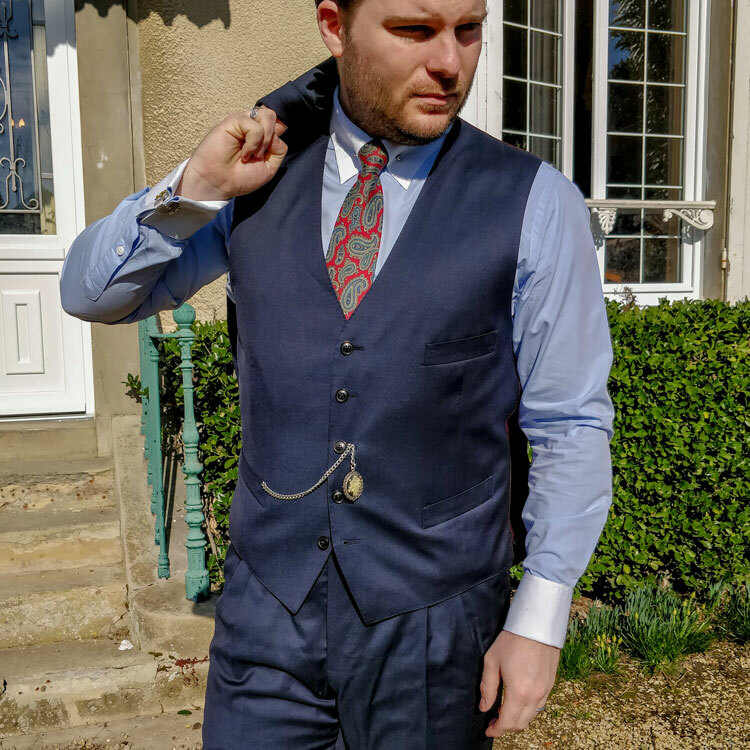 If you’re looking for a great fitting made-to-measure garment and excellent customer service, it’s worth checking out SharpSense. NOTICE: SharpSense has closed since this article was originally published. We’d recommend Indochino as a great alternative for buying quality made-to-measure suits online. Bespoke Unit received these garments free of charge for the purpose of reviewing them. Reviewed by Michael Oxman, on August 10, 2017 . "I am AMAZED with how well the suit and shirts fit! Though I wish the shirts had removable collar stays, the fit is great and the service is incredible. Definitely recommend." Has the company closed? I was glad to find such a positive review for an online MTM tailor. The link no longer works, and I could not find the company via google. We’d now recommend Indochino as a great alternative.